So the Christmas period got away from me a little so this round up of my #StitchingSanta parcels is a little late but here goes. 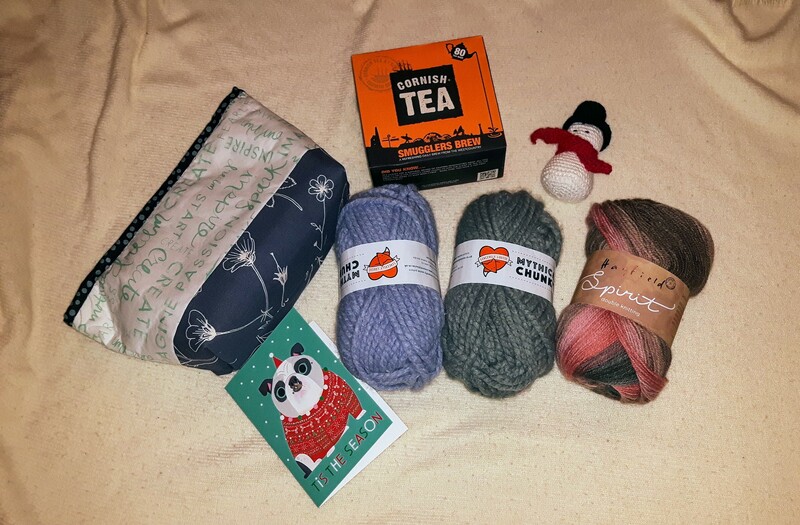 I recieved a wonderful Wooly Stitching Santa from Quirky Hannah which consisted of some Gorgeous varigated Yarn, two balls of chunky wool and some lovely cornish tea (Which has tall ships on it! ), a lovely sewn pouch and a gorgeous little snowman ornament. I have to admit I am normally really fussy about my tea and drink Lady Grey as my bog standard tea, I find PGTips etc are too liable to stew but this Cornish Tea is wonderful, I am def going to keep the box of it to myself. Also I have been looking at buying myself some varigate yarn recently but never got round to it, I am possibly going to crochet myself another shawl with this ball of wool. Admitedly it is a little outside my normal colour range but then again there is only so much blue/green that I can actually wear! I am looking forward to seeing what I produce with it. Currently as of yet I am still waiting to recieve my sewing stitching santa due to an unfortunate set of circumstances pre chrismtas for the sender. I believe both of my parcels arrived with their intended recipients so I will show a quick snap shot of what I sent out as I don’t believe they are both going to be bloged about soon. The first parcel I sent out had to wing its way to Germany to the lovey Rita at FabRita I knew that last year she didn’t meet up with her parcel for a few weeks as life intervened so I hoped that I could make something that would make her smile but would also reach her in more than enough time – although apparently it got there a little early and was tempting her under the tree. I knit her a hat from my favourite pattern, sewed up a “stowe” bag and some hand made fudge. I got a chance to practice some of my leather working and made a snips case from some lovely pruple leather offcuts that I have from a local shoe shop to my parents, I also made a matching pin cushion from the purple leather and fabric that matched the bag. I raided my quilting fabric stash that I inherited from my grandmother and picked out a rainbow of fabrics that I felt might make a good quilt. I delved deep into my bead and button stash to find some items that I thought would help her out with some of her Altzheimer blankets. My wooly stitching santa went to Rosina of Zeens and Rodger. For this one I bought a few skiens of hand dyed yarn from Wooly Goodness Yarns, made another “Stowe” Bag, a notions pouch, some lobster claw stitch markers, a ball of wool Ornament for the tree. I knit a brioche cowl in cream and blue/green wool, this nearly didn’t get gifted as it is so squishy! I also included a pendant that I made when I was in Barbados from a piece of Coral. Some super gifting going on here. Thank you, I enjoyed trying to produce a great gift. Lovely gifts all round. Think I might try to track down some Cornish tea, since it isn’t far from here to the Cornish border. Aww thanks. It was nice to make something for someone that would really appreciate it.